Want to have opinion of Instagram followers on your new dress or on your new haircut? You do not need to ask them individually. You can create a Poll and get opinion of them all by posting a single story. 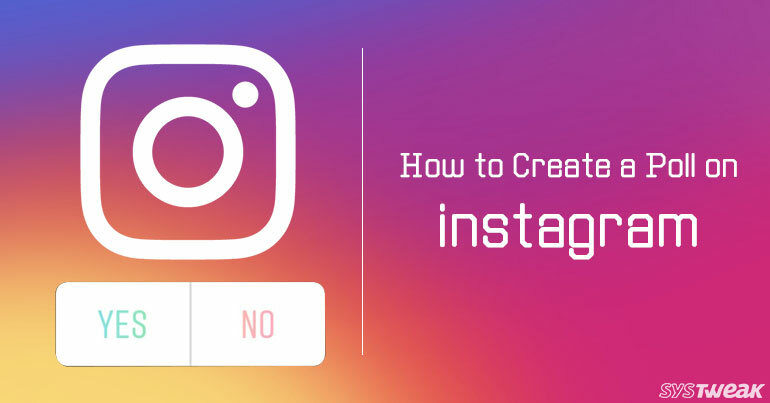 Here is how you can create a story on Instagram and can view the Poll results. Very first step is to create a story with the photograph for which you want to ask the opinion of your followers. So, get ready with the photograph and if you want to add some emojis and text. You can also use screen shot depending on the purpose for which you are creating a poll. To add a Poll to get the Opinion of your followers tap on the sticker (face shaped square) icon given at the top. You will see many options such as to add temperature, to add stickers etc. Choose Poll from here. Now you can set a Poll question and two options for answers. Yes and No are the default answers but you can change them. For if you want to ask which color suits you more, you can set options as both colors. When you are done with the customization of your Poll Tap on Done and then Send to you can send the Poll to your story or to some specific friends. Now you are done with Posting the Poll it will be active for next 24 hours People who will view your story will also be able to vote on it. You can also remove the story anytime if you want. Most important part is to viewing results to do this open your story and swipe Up on it you will be able to see the Poll results with the list of voters. This is how you can create and post Polls on Instagram. It is an efficient way to know opinion of people on many aspects. Also posting a story on your page attracts new followers. So, we can say creating a Poll on Instagram solves both the purposes at the time. How To Disable Location Tracking On MacOS High Sierra?